I’m coming back today to the topic of memorials and commemoration, which an earlier post about the new Mennonite memorial in Ukraine raised to my mind. Back in the 1990s, when I returned to university to do a Master’s degree in history, cultural history seemed in the ascendency, and within cultural history, histories of commemoration were “hot.” I read books such as Michael Kammen’s Mystic Chords of Memory and and Jonathan Vance’s Death So Noble: Memory, Meaning, and the First World War, and learned about the work of Eric Hobsbawn, Maurice Halbwachs, and Michael Foucault, discovering the possibilities around the forming and contestation of meaning, around memory and myth. It was fascinating stuff. I learned smart new words like “hegemony” and “liminal” and enjoyed using them, at least as long as I was hanging around the university with those who knew them too. But seriously, it was exciting, thinking in so many previously unconsidered directions at once. I’m just now looking through a pile of research notes I kept for a paper I wrote during that time, on Winnipeg’s celebration, in 1927, of the Diamond Jubilee of Canada’s Confederation, and I have to say, it makes me homesick to be studying again. I learned that commemoration is never neutral. Vance’s work on how World War I would be remembered, for example, had me driving around Winnipeg taking photographs of some of the monuments erected in memory of that war, and as the CPR memorial of an angel lifting a “fallen” soldier indicates, there was clearly a Christian narrative imposed on that bloody conflict, for the purposes of comfort in the face of such a useless waste of lives, no doubt, but also in the service of the glorious nation-building project. Whether in the long and multifaceted process of public remembering of a war, or a single event celebrating an anniversary, or a set-in-stone monument, we make choices in commemoration. We involve various purposes, power, and politics. Sometimes in commemoration there’s a subversion of dominant mythologies, sometimes a reiteration or underlining of them. Past, present, and future interact in various ways. So, the new Mennonite memorial. What’s it all about? This question should not be assumed to be critical. But it should be considered as a question. The story of the Mennonites in the former USSR — the story of everyone in the USSR, in fact — is certainly a story of missing persons. I like what the monument says about that. Nor is it hard, as my brief musings over one photograph in that earlier post demonstrated, to put my family’s own “missing persons” into it — personal history meeting public history. The commemorative text’s use of “Blessed are those who mourn,” from the Sermon on the Mount — which is often considered at the heart of Mennonite understandings of faith — opens any number of lines of reflection. But who is it really for? Why there? Why for Mennonites? Because they’re gone? So, when the time comes for the melancholic Ukrainian peasants to rise up against their masters and take back the land, the Mennonites will say they are lost…. …I have thought of you [Mennonites] as salt of the earth, growing out of it like the infinitely renewing limbs of willow from which we weave our fences. But yours is a story of flight and the roots spread shallow: you have to be able to get up and go when you feel the pressure, the danger; you have to be able to shake off the dirt as though this earth were not beloved. Maybe that’s what it means to be Ukrainian instead: to be everlastingly of this homeplace. You left and we grew back. You are utterly gone. No one remembers you…. Land. You had it and we didn’t. Now we’re back, in a small way, with humanitarian and spiritual programs (examples: The Mennonite Centre, and MBMSI Ukraine.) With tourists. 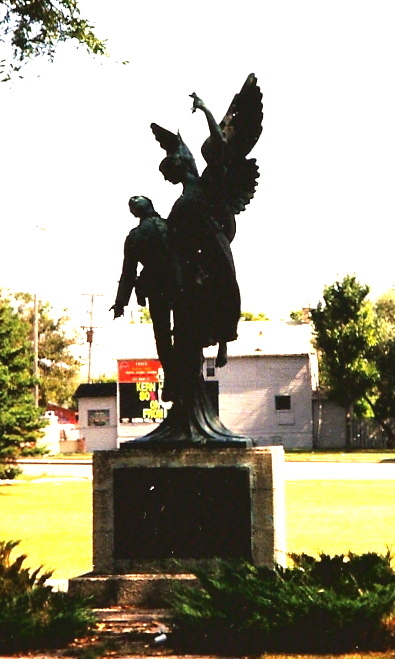 With a monument. What do we think of this memorial for a blink’s-long sojourn? It’s low to the ground; it’s in a park. Surely children, curious and delighted, their cries of play ringing in Ukrainian, are going to climb into those spaces — if they can get away with it — and fill them with laughter and hope and the future. Will that be a welcome subversion of our own memorial? This entry was posted in History, Mennonite and tagged commemoration, Mennonite monument, Myrna Kostash, Ukraine by doradueck. Bookmark the permalink. “Hmmm . . .” on the Kostash quote. There is something insightful about it. The Mennonites have always had a theology of shallow roots to any particular earth. It’s another of their Kingdom principles. I was struck by that in Belize where they are ready to leave their rich farms and move to Bolivia when an outside hand becomes too interfering [in the view of a elder/bishop]. Seems though, that what the quote misses is that they never all leave- and in fact it is rarely more than a small minority that moves on. The story line of my mother’s family, who left the Ukraine in the late 20’s, was of all those who stayed behind, by choice or circumstance. In our family narrative those left behind were the majority. The native Ukrainians, of course, ostensibly had nowhere to go- and yet here they are in the Cdn prairies along side the Mennonites. And are the Mennonites gone from the Ukraine? I thought they were still there. I know that significant communities exist in Siberia. James, I’m intrigued by your phrase, “a theology of shallow roots.” One of our Kingdom principles. So it’s a good thing? — Re. Mennonites in Ukraine. My understanding is that there are very few left. The release about the new monument affirms, “Almost none remain.” You’re right, many remained behind in the 20s, but they were exiled or otherwise disposed of, or fled, in the decades following. My husband grew up in Ukraine where he and his family were members of an indigenous evangelical church. When we visited Ukraine in 2001, I was struck by the similarities between the theology and the ethical positioning of the indigenous churches as compared to the churches planted by Western missionaries since the fall of communism. The character of these indigenous churches was noticeably Anabaptist. Through conversations with church members and with my husband’s family we pinpointed the influence of the Mennonites that, though profoundly flawed, was to blame for the unique character of these churches that survived the totalitarianism of the Soviet Union. The powerful response of the indigenous evangelical church to the state was that of non-resistance, humility, simplicity and prayer – the catalysts of the peaceful downfall of the Soviet Union. Perhaps the roots are not as shallow as it might at once appear. Sadly, the uniquely Anabaptist character of the Ukrainian evangelical church is quickly loosing ground to the influx of outside influences, Western missionaries included. I have enjoyed your blog, thanks for this post! My comment “theology of shallow roots” needs the next clause “to any particular earth”. Anabaptists for theological and historic reasons have seen themselves as “pilgrims and strangers” on earth. That is not to be confused with simple “shallow roots.” I believe that the Anabaptist legacy shows that its Kingdom roots are very deep and surprisingly resilient. I have very little knowledge of the state of the Mennonites in the Ukraine. All I have in impressions. Our family’s correspondence was with relatives exiled in Siberia. I love the juxtaposition of the last two comments on the matter of “roots.” Thanks to both! @James: Indeed the words belong together — “a theology of shallow roots to any particular earth” — my apologies — though was thinking of the whole in my response. @Jessica: this is a most interesting observation indeed, and reminds me that I want to take a closer read of Walter Sawatsky’s work on how peace theology worked itself out in the suffering context of the USSR, here. And surely that had its influence. — And I’m delighted too to be introduced to your blog and website. The “distance” series is wonderful: thought-provoking. And for sheer gorgeousness, “Field of Poppies” in your previous work. One of my favourite flowers. And such a sky as well. Well, this is what happens when you use your own name for a Google Alert – you stumble onto bloggers….I am grateful for this series of commentary on Mennonite and Ukrainian memory of a shared (however briefly) space in Ukraine. My essay in Rhubarb, an excerpt of an even longer piece in my collection, The Doomed Bridegroom, was provoked by what seemed to me the wilful erasure of the Ukrainian pre-history in so much of Menno literature about the Alte Kolonie. It’s not unlike the Ukrainian-Canadian mythology of settlement on “free lands” in the New World, emptied of any indigenous history. Of course, in independent Ukraine, one wonders if any history of so-called national minorities or of the disappeared minorities is ever alluded to in the bold new national project. 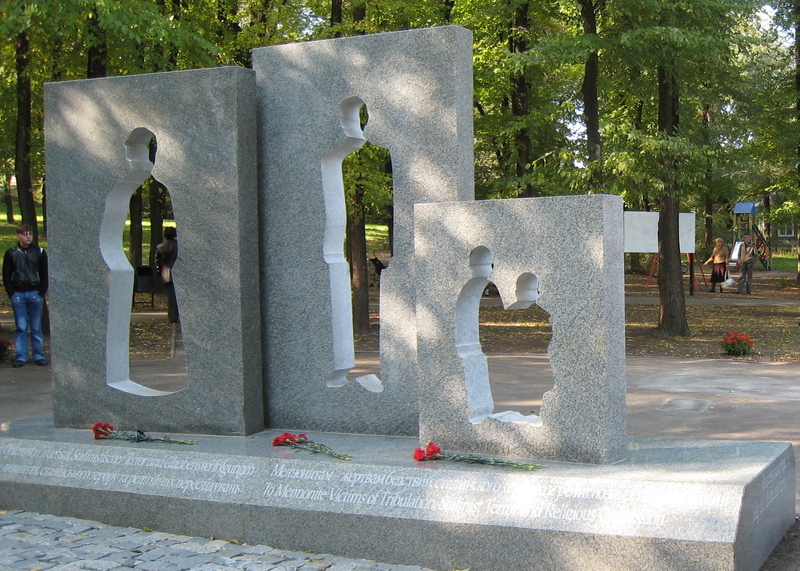 This is why it is good to have that Mennonite monument in Ukraine: it begins as Menno memorializing, then opens up – those evocative human-shaped spaces – to remember others upon others.